There are some books on this site that you can read in public and still have some shreds of self-respect left. Aaand in the smokin’ corner, the Women’s Welterweight Champion of the World! She has her hair tucked in to her own belt. She’s wearing her own hair as a tabard. I don’t care if it’s from the original book, that cannot be comfy. Where are the bees? I can’t find any bees. I PAID FOR BEES, DAMMIT!! 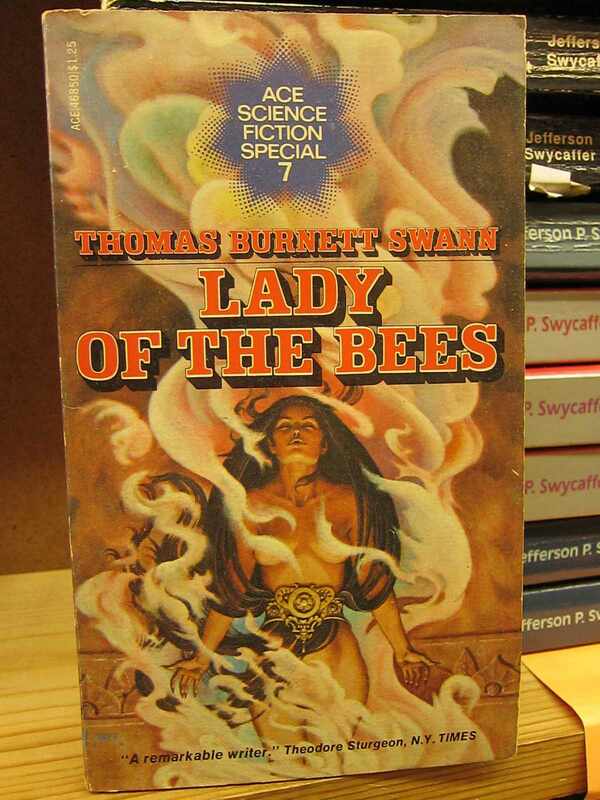 Lady of the Bees is wearing way too much perfume. Look at her hands! Yipes! Should have hidden those in the smoke as well. Space Sheep’s work here is done. That lady has a fantastic pair of….gems on that belt. Q: What kind of bees? Who’s trying to look *through* the smoke? C’mon now, fess up! And, isn’t that Caspar about to reach out and give her cheek a friendly squeeze (what he’s about to do with his lower appendage is another question)? I have updated the “Censor Steam” page on TV Tropes with this discovery. But can she sing like Lady Lamb the Beekeeper? Don’t think so. @ Tom Noir: I strongly urge you to go back to that shop and see if one of those Jefferson Swycart books in the background is a copy of WARSPRITE. @David Cowie: Oh my. If THIS is what you are referring to, I will definitely go back and look for it! I see this as an early form of inhalant abuse. One from before they had really figured out how to do it right, when they thought it’d work better if it involved the pores. This is what I always imagined the girl’s locker room at the gym must be like. @Tom Noir: So that’s …perfume?